There are numerous things I like about this office, but I think my favorite piece is the storage container for the action figures in the second photograph. Having a designated place for a collection keeps it from overtaking a room and also allows it to be enjoyed. I also like the simplicity of the desk setup in the first picture. The entire office has a serenity about it that provides a wonderful location to do work. Thanks to Cristina for sharing this workspace with us. Clutter can be a wily and cunning opponent. Sometimes, it just seems to appear as if out of nowhere. It sneaks up behind you and overpowers you with a bit of help from long work hours, too many projects, a busy travel schedule, and a lack of sleep. But, you can turn the tables on clutter and fight your way out of its grip. By gaining a good understanding of all its nuances, you’ll have a better chance of thwarting its attempt at getting control of all your living spaces. As you probably already know, you will need to craft and execute a plan of attack. In fact, each room in your home may need its own plan. Since the layout and furniture is likely different in each area, clutter can build up in different ways. So, be observant. Look out for how pockets of clutter materialize. Does it happen at night when you’re feeling most tired? Or, perhaps in the morning when you’re not feeling as prepared as you’d like to be? As you notice the particular ways that clutter collects, stage a counterattack. 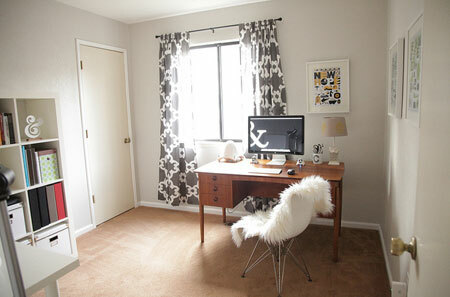 Think of specific steps you can take to stop it from infiltrating your space. For example, you might keep an “out” box for things that need to be mailed, returned, or donated. Or, you can simply use a basket to collect the stuff you bring home from work. Once you find a strategy that works, keep it in your arsenal and use it often. And, if you live with others, encourage them to do the same. Now, keep in mind that clutter doesn’t only build up, but it can also hide from you. Somehow it knows that you’ll probably forget that bag of mail that you stashed in the closet when you had company over or the linens you threw inside the closet. It can also hide in plain sight, like under furniture, inside storage chests, and under piles of paper on your desk. Your plan for each room should include a reminder to look in places that may not be so obvious. In a final stealth move, clutter can lurk in a place that’s perhaps closest to you — your mind. Old arguments, hurt feelings, past mistakes, and fears about the future can take up residence in your thoughts. When these negative thoughts congregate in your head, they make it difficult to follow through on your clutter-busting plans and, more importantly, hamper your ability to just feel happy. Flush them out and replace them with positive thoughts and ideas. But, be cautious. Even seemingly harmless things — like that great business idea or interesting project you’re working on — can take over during times that they need to be quiet (like when you’re on vacation or hanging out with friends). Give them attention when it’s time to focus on work and be sure to put them away when it’s time to relax, to have fun — to just be. Arm yourself with the right tools so you can turn the tables on clutter, and you’ll soon find yourself reveling in the victory of hard-fought battle. 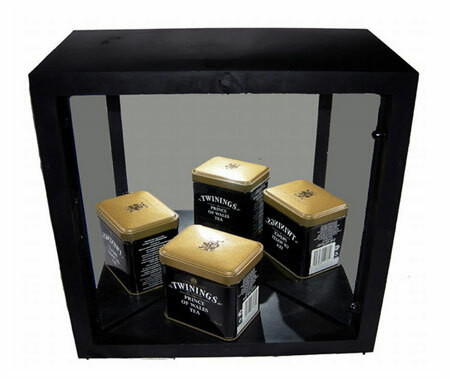 The True Mirror is a (not) exciting black box with two mirrors set next to each other at a 90º angle! For $200! I (don’t) know why you would want such a thing, as the product description says you want it so you can “See yourself with vibrancy and beauty-your natural self.” I guess it’s possible that the resourceful among you could hang two $15 mirrors in a corner of your home or just snap a quick digital picture of yourself with your cell phone to get the same inverted reflection — but why would you do that when you could spend $200 on this?! Spring has arrived here in the northern hemisphere (at least on the calendar) and that means yard work is about to begin in earnest. Here are a few simple steps that you can perform now so that you’ll be ready when the weather really warms. Hopefully you didn’t let the mower sit all winter with gas in the tank. Right? If you did, remember to let it run until it’s empty this autumn (or add a stabilizer), and hope it will start this year. You’ll also want to change the spark plug and put in a new air filter, according to the manufacturer’s instructions. It’s also a good idea to keep the blade sharp, so remove it and sharpen it. Again, the manufacturer likely supplied instructions for this, too. If not, hop online and search for digital copies of those instructions from the manufacturer. Finally, make sure the wheels are on securely and moving freely, and inspect the rope pull (if it has one). Eventually, it will wear and snap in your hand. That’s not fun. Again, hopefully you added gas stabilizer or ran it until empty last year if you have a gas-powered one. During your inspection, replace the spark plug and ensure that you’ve got enough trim cable on the trimmer, as well as an extra. Getting part way through the yard only to run out is a hassle (it always happens to me after the hardware store has closed). As you did with the mower, make sure the moving parts are operating as expected. Adjust the handle, for example, to see that it moves smoothly. If there’s dried grass and who-knows-what caked underneath the guard from last season, clean it off per the manufacturer’s instructions. Many other lawn tools don’t require much maintenance, but now is the time to check on them anyway. Things like shovels, trowels, and rakes require only a quick once-over. I also confirm that my extension cords are working and not torn, as well as the garden hose. Finally, move tools that you won’t be using, like snow shovels, out of the way and store them for the warmer months. I move mine from the shed to the basement for the spring and summer. Last year my wheelbarrow had a flat tire, so I filled it with air. It was flat again within a week, so I simply replaced it with a solid tire, much like this one from True Temper. Now a flat tire is no longer an issue. Speaking of the wheelbarrow, this is the time to hit it with some rust-proof paint if you find it needs it. I don’t know about you, but my outdoor furniture takes a beating. Between the blazing sun, occasional rain and — worst of all — my children, those cushions start showing their age after just a few seasons. A discount big box store is a good place to find replacements if yours are in need of an updating. Also, keep that can of rust-proof paint and/or a scrub brush handy. So much has been written about spring lawn prep. This tutorial from Lowe’s is similar to what I do. I think the most important take-aways are to clean up any debris that was deposited during the winter, cut everything nice and short, and then note any problem areas like bald spots. Next, aerate it. You can likely rent one of these for a day or even a few hours from a local hardware or home improvement store or a garden nursery. This breaks up the soil and lets water and beneficial nutrients get down in there. Plus, lawn aerators are just fun to use. Those are the basics. If you have something like an outdoor shower or in-ground irrigation system, wait for it to warm up a bit before turning them on. Then test each zone to ensure proper working order. With as cold as it has been so far this spring in the northeast, I’m also waiting to turn on my outdoor water spigots. Do you have any springtime yard rituals? Share your routines in the comments. Want to be more productive? Get more sleep. Do you find that it’s difficult to keep still and do nothing? Even when you’re supposed to be relaxing (and though your body may not be moving), your mind might be running though your task list and the many things that you need to get done. Or, perhaps you decide to stay later at work a few days per week in an effort to “catch up.” Though you may be in the mindset of trying to get things done, if you don’t get enough sleep, this can decrease how much you actually get done and increase your stress. And, when you’re stressed, you won’t sleep very well. This is a vicious cycle. Spending more hours at work often leads to less time for sleep and insufficient sleep takes a substantial toll on performance. In a study of nearly 400 employees, published last year, researchers found that sleeping too little — defined as less than six hours each night — was one of the best predictors of on-the-job burn-out. A recent Harvard study estimated that sleep deprivation costs American companies $63.2 billion a year in lost productivity. Though it’s intended to be helpful, the snooze button on your alarm can interrupt your sleep cycle which will in turn make you feel more tired and groggy (this is known as sleep inertia). You’ll feel this way because your body may not be ready to be awake (depending on the stage of the sleep cycle that it’s in) when the alarm sounds. This can translate into poor performance during the day. Instead, implement a consistent sleep schedule so that you are not dependent on the snooze button. Get up and go to bed at the same time every day so that you create a pattern of restorative sleep (you can even use a sleep cycle app on your phone to help). Recovery time can include planned breaks from working on your projects. It can also mean taking power naps during the day (whenever possible), particularly if you didn’t sleep well the night before. You’ll want to take relatively short naps so that when you wake up, you’ll feel more alert and energized. Though napping longer than 20 minutes has benefits (like better decision making and being able to recall directions more easily), if you get into a very deep sleep, you may wake up feeling more tired. Consider experimenting with shorter or longer nap times to find the right amount of time that will help you to recover. While everyone needs downtime, exercise has been proven to have a positive effect on how well you sleep. In fact, according to the National Sleep Foundation, “just 10 minutes of exercise a day could make a difference in the duration and quality of sleep.” The good news is that you don’t have to carve out several hours to exercise, but rather build in a short stints of energetic movement throughout your day to reap the benefits at night. When there’s clutter build-up in a room, there’s likely to be a good deal of stress felt when you’re in that particular area. So, set the stage for a restful night by uncluttering your space. Put away clothing and keep your nightstands neat and organized. Be sure that you don’t keep receipts, mail, or any other (non-sleep) related items hanging about. One thing you can keep on your nightstand: a sleep journal. Use the journal to track how well you’re sleeping, how much sleep you need to function optimally, as well as specific things (soft music, completely dark room, bath before bed) that help you achieve restorative sleep. So, this isn’t a sleep tip specifically, but it’s good to put it into practice as it can have big results. Though I’m suggesting that you should do less, please don’t throw your to-do list out the window! Doing less doesn’t mean that you should ignore your responsibilities. It simply means that you should focus on one thing at a time, instead of trying to wrap your mind around several tasks and projects simultaneously. This can be tricky at first, but after a bit of practice, you’ll begin to notice that you can get more done and, perhaps more importantly, you’ll have a greater chance of getting things done more completely (and with less stress, too). Getting enough rest should be at the top of your list if you want to improve your ability to be productive. If after trying some of today’s suggestions you find that there has been no improvement to the quality of your sleep, consider talking with your doctor to see if there are other things that could be having an impact (like certain medications) on your performance. this week’s doozy of a unitasker. It doesn’t slice, it doesn’t dice, and it most certainly doesn’t julianne. In fact, the reviews for the Peel-a-Meal indicate it doesn’t even de-skin six to eight potatoes very well in 30 minutes. Oh, and it’s supposed to be really loud. I am pleased to announce that these layout errors have finally been corrected by my publisher, and a new Kindle version is available for download. I know that not everyone is on board with reading electronic books as a way to control over-flowing bookshelves, but if you are, you might be happy to know that Kindle software is now available for Mac. My answer to the question, “How much is enough?” is turning out to be much less than I imagined. My family and I don’t require too many physical objects to be healthy, happy, and comfortable in the modern world. The Cupmen Instant Noodle Figure rests on the lip of your steeping noodles and tells you when they’re “done.” In three minutes, the plastic, heat-sensitive Cupmen Figure transforms from a little blue guy into a little white guy. When he’s all white, you know your noodles are ready to eat. Yay, unnecessary plastic doodads! My initial inclination to planning for business growth was to do more. Work more hours. Put my kid into more programs. Just cram more into my life for a period of time. You know, weather the beautiful storm. But this time, I stopped myself. Overall Leeds writes a heck of a book on organizing your life on a one-year plan. Ask Unclutterer: How to store transient items? My “Ask Unclutterer” question has to do with what I call “transient items.” It’s the birthday gift you purchased but you won’t see the recipient for a few days/weeks or the cupcake carrier that usually stays in the pantry, but a friend needs to borrow it, so you get it out so she can come over for it. What is the best way to deal with these items? In our home, we have an old laundry basket on the floor of our main coat closet where we put these sorts of items. It’s nice because even if one of us isn’t home, if someone stops by to pick up items, other people in the house know where to find whatever is being retrieved. We also put items in it we don’t want to forget when we run errands — like a bag full of dry cleaning. Other ideas might be to clear the top shelf of your coat closet and use it as your transient area or get a bench with hidden interior storage and put items in it. Benches are nice in hallways because they give guests a place to sit if they’re waiting on someone, as well as a place to park yourself if you want to take off your shoes. The Red Chair Blog suggests using storage cubes with labeled boxes set out in a hallway, though I would suggest sticking the cubes in a closet if you have a closet near your front door. Or, if you have a garage, this could easily be stored in it next to the house entrance. Thank you, Heather, for submitting your question for our Ask Unclutterer column. Be sure to check our comments for even more ideas from our readers. Google surprised many Google Reader users when it announced the service would cease to function on July 1, 2013. Google Reader is the company’s free, browser-based RSS reader that thousands, if not millions, of people use. May users are now searching for alternatives, especially those for whom RSS is an integral part of their workflow (including yours truly). With that in mind, I found some great, web-based RSS readers that will work on your Mac or PC, as that’s the niche Google Reader filled. Onward! Feedly is a very popular option. So much so, that the company saw 50,000 new members join within 48 hours of Google’s announcement. It’s more stylized than Google Reader and has a newspaper-like feel in the way feeds are displayed. Some folks will like that, but others who were accustom to Google’s more stark appearance might find it off-putting. There are Feedly apps available for the iPhone, iPad and Android devices, and they all stay in sync nicely. So, if you add or remove a feed on one device, the change is reflected on the other devices instantly. 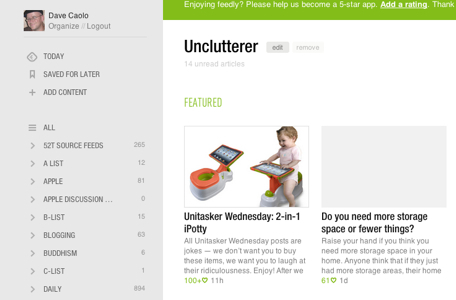 Feedly is free and lets you import your Google Reader feeds easily. Another popular choice is The Old Reader. It’s appealing because it was molded on Google Reader, and offers many of the same features. Note, however, that The Old Reader is still in the early (beta) stage of development and that means it isn’t feature-complete and may have some bugs. The Old Reader will let you import your Google Reader information (though less elegantly than Feedly), and organize feeds into categories and folders via drag-and-drop. It’s got good support for keyboard shortcuts (so you spend less time reaching for your mouse) and a fun social feature that lets you share interesting articles with friends on Facebook or among your Google contacts. 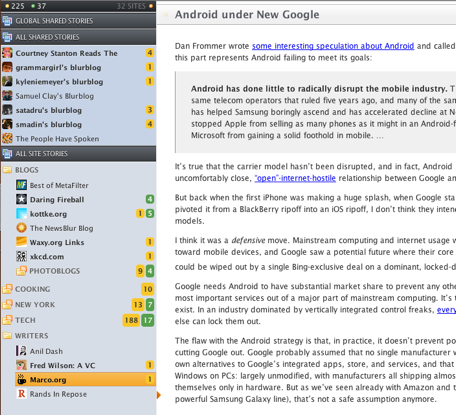 Newsblur is another browser-based option with free apps for the iPhone, iPad and Android devices. It offers a few niceties that go beyond what Google has been offering. For example, there are a couple ways to view an article: as it appears on the originating site, as they’re set up to appear in RSS or stripped of images and ads for a nice, clean and distraction-free reading experience. Of course, you can organize your feeds into folders and keep everything in sync with your mobile device. Another standout feature is that Newsblur offers tiered pricing options. The free version limits you to 64 news sources, and each can display 10 at a time. Premium users who pay $24/year are free of those restrictions. The company is seeing very high demand and has temporarily stopped accepting new free accounts. But, we still have four months before Google shuts Reader down, so keep checking back on Newsblur if it’s one you’d like to try. I’m sure demand will reach a manageable level soon. Bloglines is a veteran news reader, having been around since 2003. There are no mobile apps, so this is an entirely web-based solution. Of course, you can organize and sort your feeds as you like. There’s good news for Bloglines’ future, too, as it was recently announced that MerchantCircle is going to keep it up and running. There are other web-based RSS alternatives, but these are the ones I like. Others are still in development and not yet available, like Feed Wrangler and Feedspot that have been announced since Google’s news. Again, these services aren’t up and running yet, but you can sign up to receive information as it becomes available. Finally, you’ll need to export your Google Reader data before you can move it to a new solution. Fortunately, I’ve written a brief tutorial on how to do just that. Do you have an alternative that I’m not aware of? Share it in the comments. She was right, I had failed you all. And, I’m sorry for not presenting the iPotty at the same time. This was such an egregious oversight on my part. Because, I missed one of the most special unitaskers of our time. So, today, I rectify this wrong. I present what is one of the worst product ideas I can possibly imagine — a device that puts a $400 (or more) digital product near the stream of pee (and, you know what else) of a toddler just learning to use the potty. It also requires mom or dad to have an iPad available EVERY time the child uses the potty because no child will ever go to the potty without it there once he knows it’s an option. 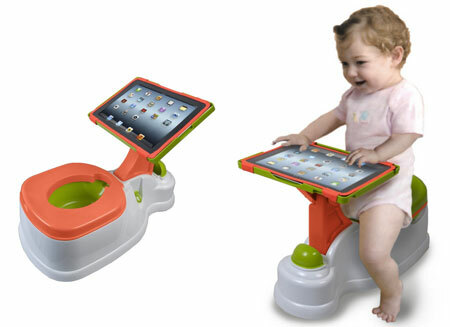 For the rest of the child’s life, she will want a digital device with her when she uses the potty. And … ewwwwww! Sure, it’s technically a multitasker. But, as was the case with the adult version the iPad stand and toilet paper roll holder, since our only criteria for picking unitaskers is: “Does it make us laugh?” It, technically, qualifies. This is one funny (and very, very bad idea) product. Even in the digital age, many people can work with active files and papers. Here are some suggestions for dealing with this mass of paperwork. Around 1:15 this morning, those of us in the northern hemisphere officially started spring. The local weathermen explained to me as I sipped my coffee that because this is a leap year, spring showed up on the calendar a day early. If spring sprung up on you and took you by surprise, the following 10 tasks are what I consider to be the most valuable spring cleaning activities. These are the Firsts, the things to get to before the other activities. What is a good computer set-up that can also be locked away to keep little fingers away from the keyboard, mouse, and tower? We’re looking for something relatively inexpensive, but we haven’t found a good solution that would also fit in a living room, since our computer/monitor also functions as our TV/DVD player. Any suggestions? The “space saving design” is a little suspect in that it displays the jars in a vertical fashion rather than simply stacking neatly in your cupboard. Built NY has recently unveiled a couple of useful baby products that will surely be put to use by new parents. Do you need more storage space or fewer things? Raise your hand if you think you need more storage space in your home. Anyone think that if they just had more storage areas, their home would be easier to maintain? Sometimes I wish my home had more closets, especially a dedicated linen closet. But, I’ve found a way around that and, honestly, I don’t need a separate space to keep towels and sheets, which means it’s probably more of a want and not a need. Of course, if you live in a small home, your storage options may be limited. You’ll likely have to use tried-and-true techniques (maximize vertical space, use under bed storage, hooks, armoires, etc.) and take advantage of creative solutions, like using multi-purpose furniture or hiding things in plain sight. You might even come up with some unconvential ways to keep your stuff, like using a car or minivan (that isn’t needed for transportation) as storage space. In a recent blog post over at Extraordinary Observations, Storing Private Stuff in Public Space, the author started giving this some thought. He reasoned that it would be very convenient (the vehicle would be parked close to his home) and when he crunched the numbers, he found that it would be a cost effective option, too. … street parking (public space) is used to store automobiles (privately owned things) for little to no cost (it would cost me $35 per year for a residential permit in my neighborhood). Using a van for storage would cost significantly less money than renting a space at one of those self storage warehouses, and it would be a lot more convenient. It’s an interesting notion and it seems to make sense from a monetary standpoint. For anyone seriously considering this as a solution, another question comes to mind. Why not reduce your stash so that the car isn’t needed for storage? You wouldn’t have to worry about the types of things you could store in your vehicle (since it’s not temperature controlled) nor would you have to be concerned about someone stealing it. With one less spot to maintain, you’d also have less work to do, fewer decisions to make, and more time to focus on other things. And, you’d have the option of selling or donating your car, both of which come with financial benefits. Though the benefits of living with less are clear, going through the process is not always straightforward or easy, especially when you have to let go of things that you’re emotionally attached to. When faced with the task of uncluttering and downsizing, it’s important to remain focused on the positive outcomes of reducing the number of things you own (particularly if you don’t use or want them). Keep in mind that you can also handpick who receives certain items which can help put your mind at ease. Of course, simplifying doesn’t mean that you have to get rid of everything. You’re simply prioritizing and carefully selecting which items you will bring the most value to your life. Ultimately, anyone going through this process will need to answer this question: Will a storage unit (of any type) be a regular and permanent part of your life, or would you prefer to find a way to live well with less?